Oh goodness! I can't believe it's been almost ten days since I last posted here! Life has been so crazy busy. We are wrapping up our move and the kitchen remodel on our new home. It's looking so nice and bright in there! We have to be out of our townhouse by Sunday so we have been running around getting everything ready. There's been no time for shoots the last couple weekends; but this week I WILL make time for a couple posts. 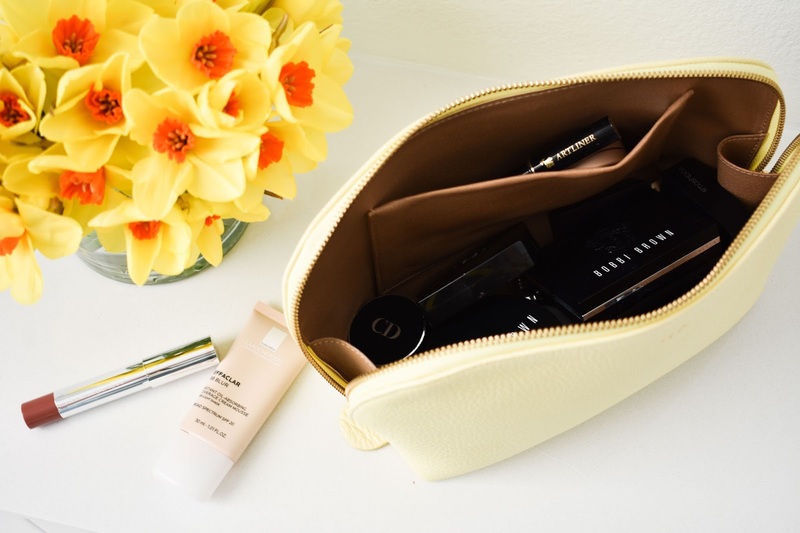 First up, the review of this wonderful Cuyana Travel Case Set. I'm obsessed! I had been looking at this set before Christmas but could not bring myself to spend $100+ dollars on a make up bag. It was time to upgrade my Anthropologie make up bag and my $ 6 Forever 21 bag I had been carrying in my tote. I finally decided to pull the trigger a month ago since I found myself looking at them on the website almost every day. Construction: The cases are very sturdy, each piece is nice and thick and the leather is beautiful. When they first arrived the leather was somewhat stiff and hard but now that I have been using them for over a month they have definitely softened. The zipper is very strong and keeps the items inside well contained. Due to the flat bottom the cases stand on their own, and even with the soft leather the walls of the bag still stay up and straight as you use them. Interior: The cases are lined with a soft brown synthetic fabric that makes it easy to wipe it clean. I'm very OCD about having my make up always be perfectly clean and looking like it just came out of the box; I don't usually worry about getting the interior of my make up bags dirty because I wipe everything as I use it. Accidents do happen though and sometimes eyeshadow or loose powder spills, the color of the interior makes it easy to mask any potential stains that may remain even after cleaning. Monogram: I looooooove all things monogrammed, so of course I paid the optional $15 to have both bags stamped with my initials in gold. I love it! It matches the zipper so well and gives it a little extra detail that makes them special. I've gotten so many compliments every time I pull out the small bag from my tote. Size: The large case is 7" x 12" x 3.5" and the small case is 5" x 8" x 2.5". I included the pictures above by my toothpaste so you could get a general idea of the sizing. The large case is LARGE and fits so much stuff. I can easily double as a toiletry bag and I would be able to fit full sized deodorant, toothpaste, body lotion, etc. The small one is also large enough that I can carry my everyday make up, lotion, pills, toothbrush and toothpaste. They are both very spacious without being bulky. So are they worth the price? In my humble opinion, yes, they absolutely are! I will have these cases for years and years to come and I can already tell they will hold up well and only get more soft as they age. 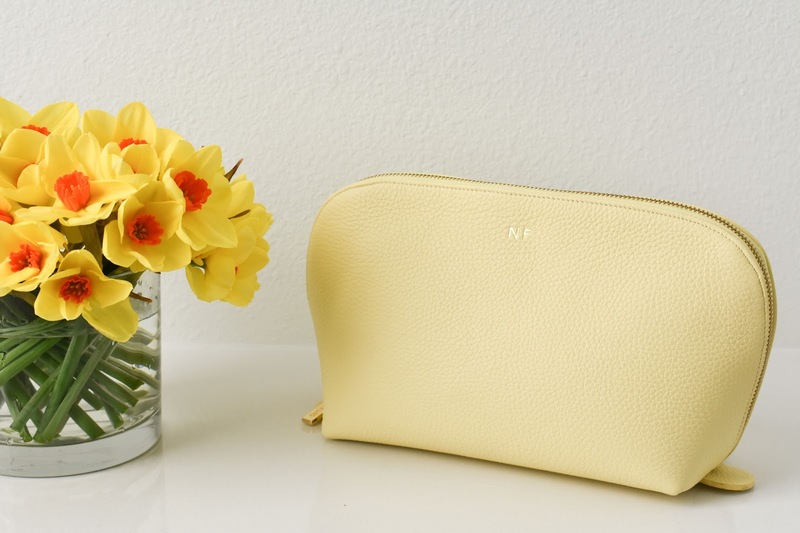 I have owned this Cuyana wallet for almost two years and I am amazed at how new it still looks and how well it takes the abuse inside my purse. 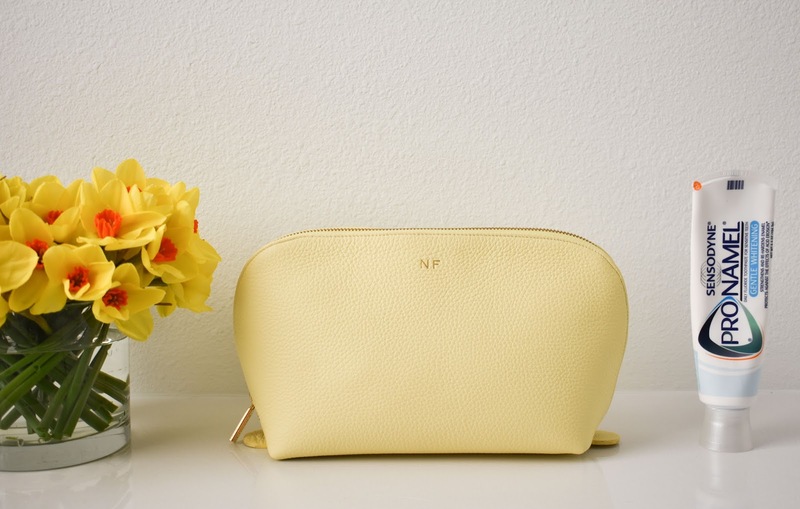 If you are in the market for a new make up bag I encourage you to consider this set, you won't regret it! 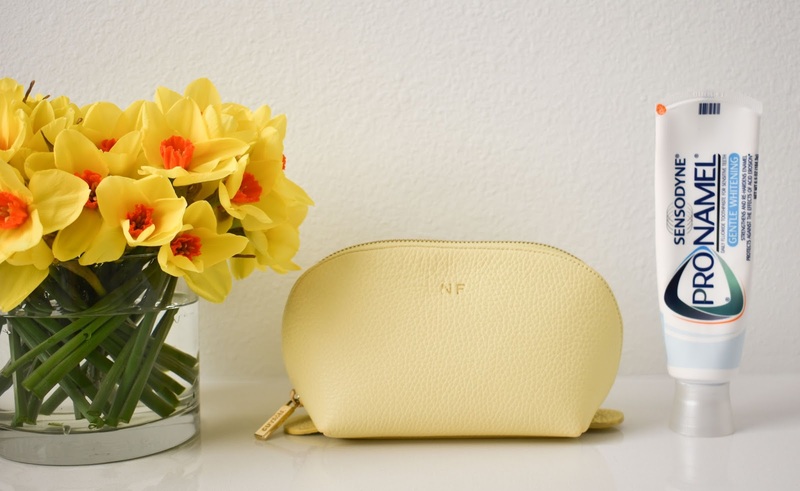 The next Cuyana item on my wishlist is this gorgeous travel wallet; I need to get it before my summer vacation in June! I'm also madly in love with this bag, so perfect for work! Hope you enjoyed this review, let me know what you think :) Talk to you soon! Thanks girl! I like that you live in London, LOVE THAT CITY WITH ALL OF MY HEART AND THEN SOME! Love the travel case! So cute and the color is beautiful! I agree! Pretty things make me so happy! Oh, I just love it! I want a monogramed make up bag in my life ASAP! 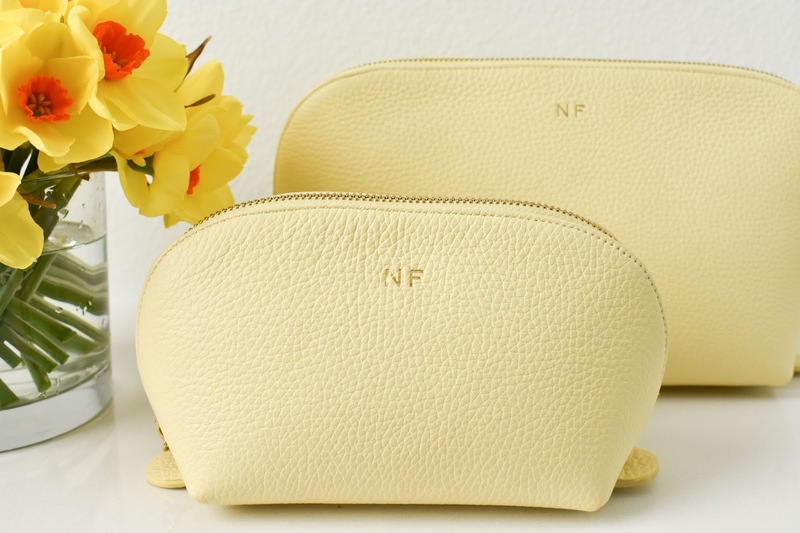 This travel case set is so pretty! I love the color!